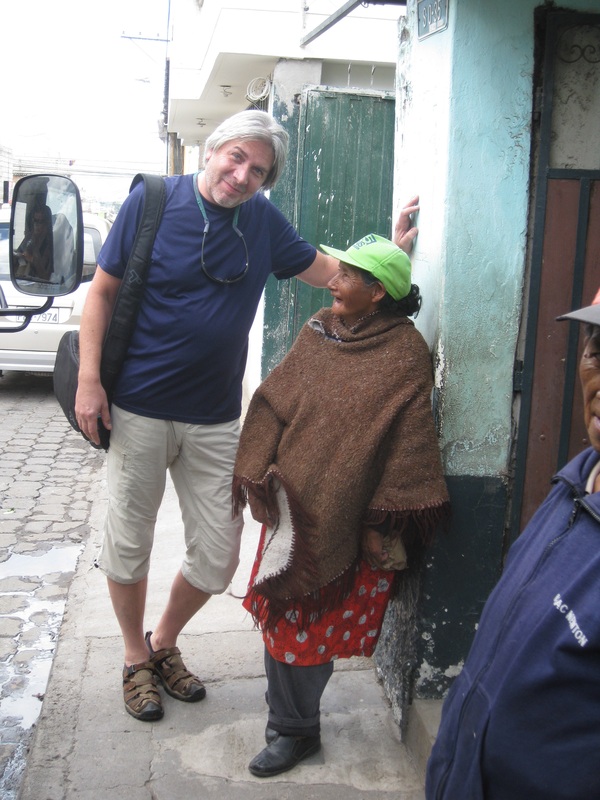 Well, I have come to the end of week 1 in Ecuador, and what a ride it’s been. I realize that for some of you, all the nitty gritty, day to day stuff may be boring. So I will try a new format, starting with a bullet list of random thoughts and observations for those who want it short and sweet, and a full day by day insight for those who are interested in reading more. Dogs: there is a dog society, parallel to humans, in most of the small towns I have visited. Dogs are walking around the streets–alone or in groups–going about their own business, running their own show–seemingly unaware or oblivious to what people are doing. I have never seen anything quite like it. Popcorn: served with virtually every meal. No movie required. 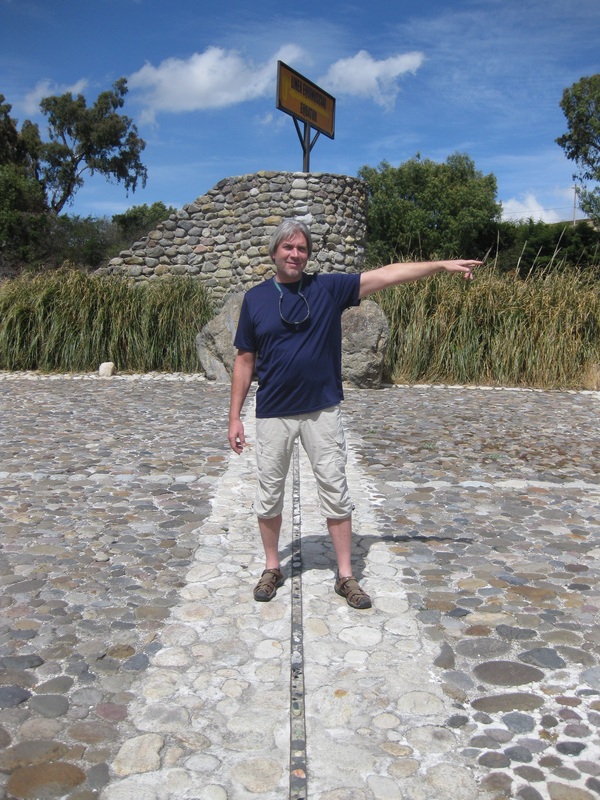 The equator: I assumed it would be stupid hot here because Ecuador is on the equator. Not so, at least so far. 8-23 Celsius in the mountains, and 18-27 Celsius on the West coast. One day last week, pea-sized hail was actually falling from the sky in Quito! Wild. Gas: 36 cents a litre! Exports: Ecuador is the number one exporter of bananas and tuna worldwide. Hats off: the Panama hat is actually made in Ecuador. Young at heart: I was by far the eldest in the hostels I have stayed in so far. But somehow I don’t feel out of place. Like-minded travelling souls perhaps. People and pride: people care here. They may not have much, but they take pride in what they do have. They are understated and not aggressive. Flying into the capital city of Quito, Ecuador was pretty cool…dropping into a mountainous valley 9,300 above sea level, twice the altitude of Denver Colorado. And what a pleasure it was to finally arrive after a long (and thankfully uneventful) day of travel, greeted by a very friendly and hassle-free immigration officer at the Quito airport. I then got into an airport cab. The driver was a very nice, pleasant older fellow…but he had no idea where he was going. I think was suffering from early stages of dementia. Poor guy. He must have stopped 10 times for directions, and then promptly forgot them every time! Mumbling to himself, then laughing. So a one hour trip took two. Finally arrived at a very basic, but nice and clean and friendly hostel in a busy central neighbourhood…good vibe. Hotel staff Alejandro and Andres made me feel totally welcome. No doubt the whole hostel thing was a good idea, as there were people staying there from all over the world. Lots to learn from fellow travellers, but I really was too tired too talk to anyone the first night. But I did much better the second day, meeting lots of new people, including Mark, a young Irishman living in Ecuador. I would end up spending lots of time with him in my first week. That usual initial fear of the unknown was, and is always right there, but I pushed through it, and ventured out on my own to walk around the neighbourhood on day 2. 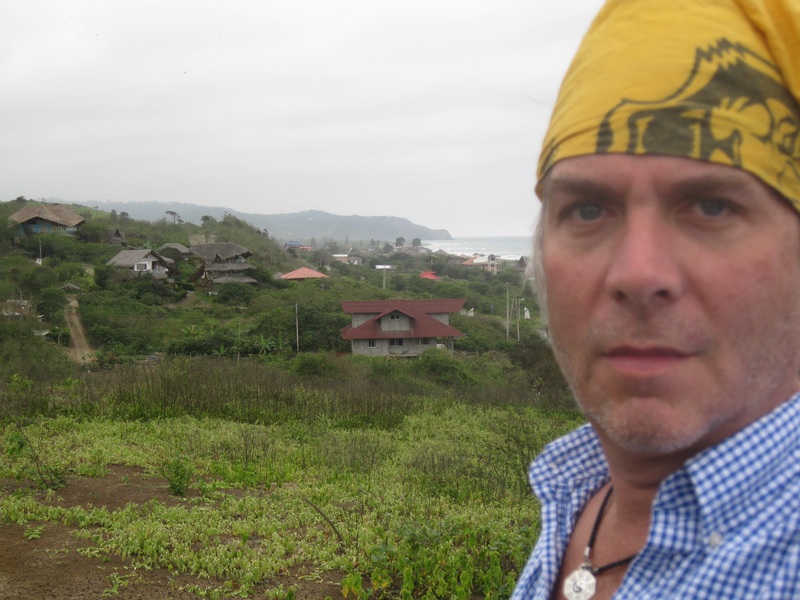 I had it in my head that I was arriving in a picturesque little Ecuadorian town. Wrong. 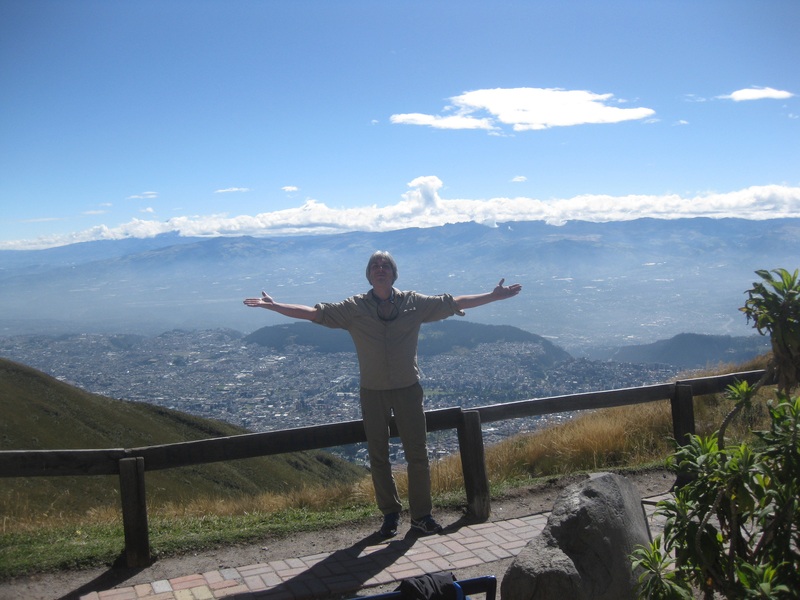 Quito is a huge city of about 2.5 million people! The most unusual thing I saw was a female police inspector wearing 3-inch heels! I really do not like big city life, but I made the most of my surroundings over the next several days. A few food highlights of the day: a fresh juice I had never tried before (tree tomato), a delicious seafood ceviche, and an interesting combo of figs and cheese (queso) for dessert. Yummy! The highlight of day 2? While I was walking around the city, a car was backing up and there were a bunch of small kids behind him. I jumped between the kids and the car and stopped him. We all kept walking and when I looked back, a young girl smiled shyly at me and said “gracias.” A very touching moment. I started day 3 by climbing a volcano that overlooks the city…well not actually climbing. I took the cable car to about 13,000 feet. The air was even thinner up there, and I felt a little light headed and out of breath, but the view was spectacular. Then met a group at another hostel for a 3-hour walking tour of the old town. The guide was really good–engaging and informative–and I learned some Ecuadorian history and culture. Then the rain and cold came in a big way. Not only rain, but pea-sized hail!! But by the end of day 3, I was certainly becoming much more comfortable and confident. 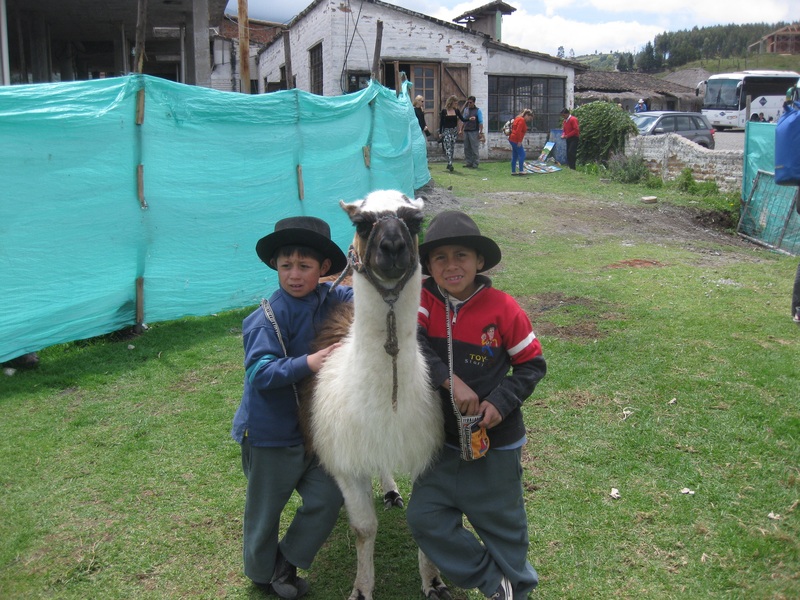 Saturday I took a day tour several hours north of Quito through the Andes mountains. We made several stops, the highlight being Otavalo, home to south America’s biggest Saturday market. I am not a shopper, but I did enjoy this place. Huge market, but surprisingly calm and “tranquillo.” Unlike many other peoples, Ecuadorians are not aggressive when it comes to selling. 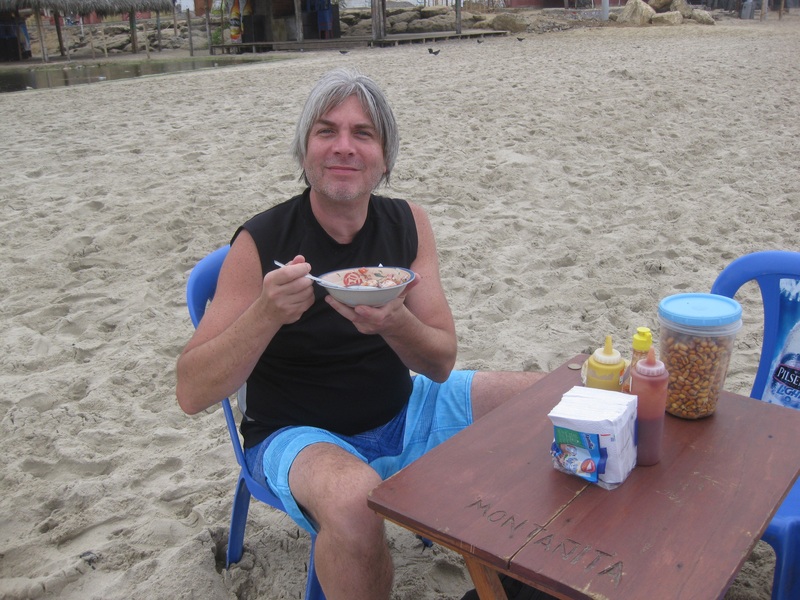 I am very careful about what and where I eat when I’m travelling–nothing worse than getting sick thousands of miles away from home–but after carefully scoping out the food stands, I enjoyed a delicious freshly pulled pork snack for $1.50, eating with locals. Although the day was a little touristy, this was a really good way to make this kind of trip. I also really enjoyed chatting with some of the others in the bus…visitors from Germany, Thailand, Switzerland, US, and Canada. Even a US pilot. I learned about them, and picked up all kinds of useful travel tips and info. Made a few stops along the way, including a mountain lagoon and the equator line. Pretty cool to have one foot in the north hemisphere, and one in the south. One foot in the North, and one in the South. pointing North. One very interesting thing I learned about that was a new way to look at the Earth. Kind of hard to explain, and I’m not sure I completely understand it, but the gist of it involves looking at the earth not as upper and lower hemispheres, but as left and right. North, South, East, and West stay the same, but the Earth is, in effect, turned on its side. If you hold a globe below you, looking at the equator with North on your left and South on your right, and spin it away from you! You get the idea. A whole new way to look at Mother Earth. Day 5 (Sunday), I drove with Mark from Quito, heading South and West through the mountains and down to the coast. It was a very long drive…about 10 hours…but the 1-hour descent from about 9,000 to about 2,000 feet was wild. Twisty, turny roads, driving through the clouds, crossing different climate zones…it was an incredibly spectacular part of the journey. We finally made it to the modern port city of Manta (one of the biggest drug ports in the world apparently), then south along the coast to Salango, a small fishing village just outside of Puerto Lopez. We stayed at a very basic, but clean hostel for $8 a night. The best part was falling asleep to the sound of the ocean. 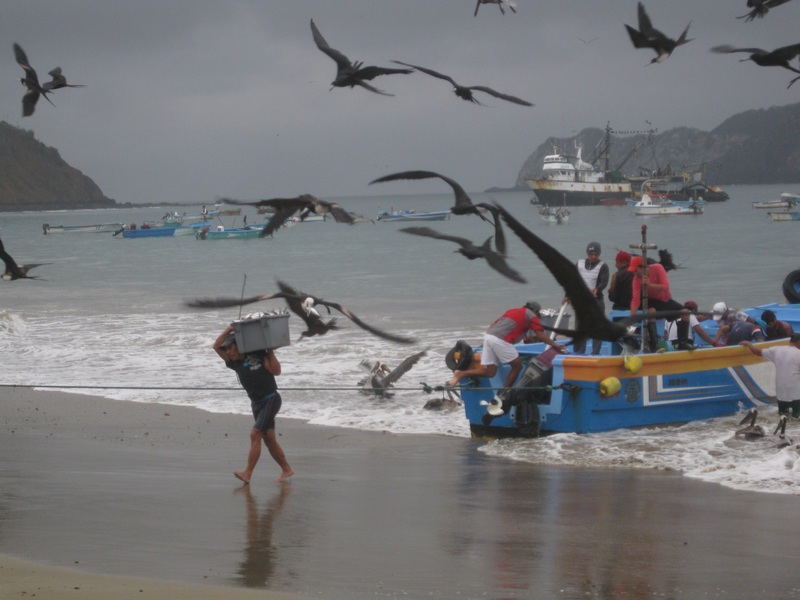 Fishermen arriving with their early morning catch…and the birds trying to get a free meal! On Monday we visited a large Canadian real estate project (Hola Ecuador) which is about 45 minutes North of Salango. From there, we travelled South, stopping at most of the beach towns and main beaches along the way. Quite a nice stretch of about 60 km. between Puerto Lopez and Montanita, which is a very cool surf town. Lots of life and activity there compared to the others. Beach bums, hippies, and great waves. Then back to Salango for a second night. On Tuesday (day 7), we and headed south, back to Monanita where Mark dropped me, and where I will hang out for a few days. Earlier in the week, a fellow traveller recommended Balsa Surf Camp, a hostel, off the beaten path but on the beach for $25 a night. What a beautiful place this turned out to be. A lot of care and attention and thought has been put into this comfortable and relaxed oasis. Feels very welcoming and peaceful here. I have not been feeling 100% healthy over the last few days–adjusting to the food, fighting a cold–so this will be a restorative time I think. Spent the rest of the day walking the beach and doing some body surfing, getting to know the water. Not quite up to the physical demands of surfing yet, so will hope to do that tomorrow as I begin week 2! It is very interesting how things have unfolded this week, the people I have met, and how one person or place leads to the next. I could never have predicted how any of this would unfold. I did not have a firm plan, yet things have turned out just perfectly. It reminds me of the gift that is the present moment, and allowing myself to go with the flow. A few final thoughts…every time I arrive in a new place, I wonder what the hell am I doing here. My reflex is guarded and nervous and suspicious in various proportions and amount. I tend to want to keep to myself. And when I do that, invariably, that’s exactly what I get back. But I push through it, and make an effort to connect. And that changes the whole experience to something very rich and meaningful. Even though I don’t know much Spanish, I make an effort in their language. I make an effort to know them. And that goes a long way to breaking barriers. Smiling, asking their name, showing an interest, trying to engage…it changes everything. I have been warned about all kinds of dangerous situations and scams and I am mindful. But I am reminded time and time again that when a I treat people with kindness and openness…the way I want to be treated….I invariably get the same treatment in return. I am perhaps naive in some ways, but I do know that people are fundamentally quite similar, and respond to the same things, whatever country they’re from. Now why do I work extra hard at this only when I am in unfamiliar territory….need to think about this one. Any thoughts or questions? Don’t be shy. ‘Til next week.